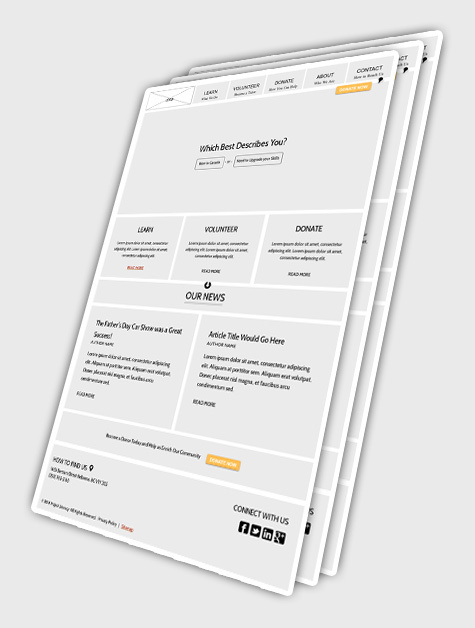 We recently completed the Project Literacy website for a client here in Kelowna. This is a non profit organization that provides free literacy training for Math, English and other subject to students and adults alike. The old website was a basic brochure that you would see in a directory service like YellowPages or Infotel. Other then the basic address and contact information a fairly useless website for today’s standards. The new custom website design is a real marketing and teaching tool, providing focused information to different users in an effective way. For this particular custom website design project we set out to identify the people who would be using the site. We discovered that the old website did not address any of the visitors coming to the site in a meaningful way or provide specific information based on their interests. As no understanding or logic was present there was also no clear conversion point or structured calls to action for the user. To some degree this was a blessing as it allowed us to start with a clean slate and plan out the new custom website design from scratch. All the old content was left behind and we began looking closely at what the audience coming to the site wanted to accomplish. The new custom website design focuses in on the key visitors to the site. We created three core personas and documented what their expectations where when they came to the new website. We then planned for the site map, information architecture and user experience design to follow their specific needs. This resulted in a clear path on the website for the students, the tutors and the donors, each with their own path through to conversion. We documented all of these through the use of a wireframing tool online to make sure that the purpose of each page was clearly defined before the design work began. For the Students we created two distinct calls to action that took them to a specific landing page. 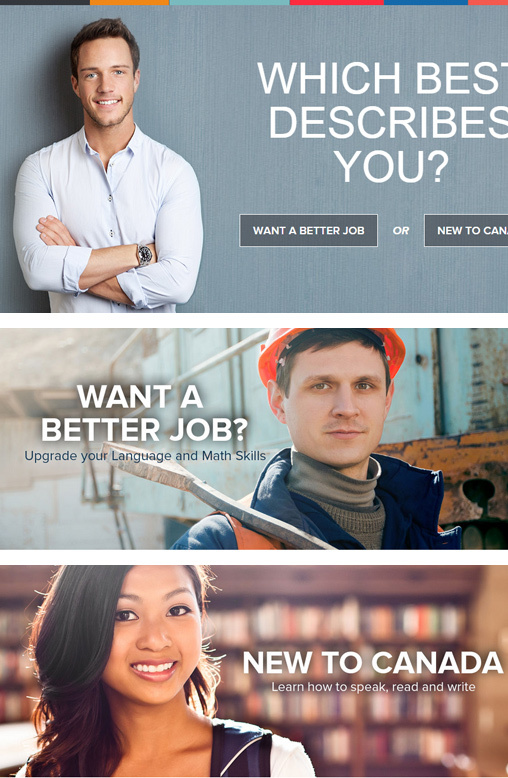 One for people working in the trades and looking to upgrade skills and another for students looking to improve their English skills for exam and academic pursuits. These two groups quickly became the priority item for the homepage and took top spot in the site architecture with dedicated landing pages for each, directly from a strong call to action on the homepage. Which best describes you? – want a better Job? New to Canada? Two secondary but equally important users were also considered. The Donors needed to be recognized and acknowledged for their incredible support. In the old site this group had been completely ignored yet they are the very reasons this educational facility exists. By promoting and supporting the Donors Project Literacy is giving back to their valued sponsors. We also added a Donate Now button with a direct link to Project Literacy’s Registered Canadian Charity page on Canadahelps.org This allows for direct contributions to the Non Profit in a very efficient way. The last group seemed obvious but was not well presented. The teaching staff at project literacy is made up from a group of amazing volunteers who spent considerable time every month to furthering the skills and education of the students. 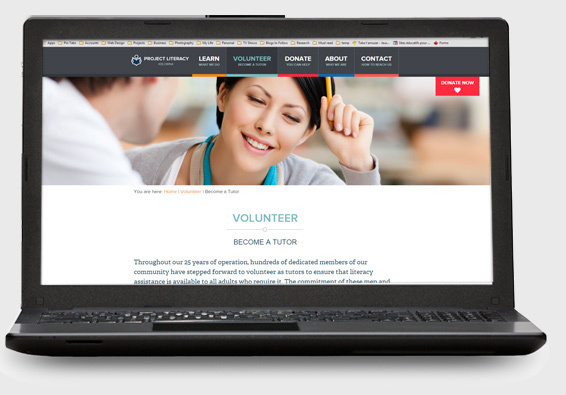 These Tutors are a great group of Volunteers and the new section on the custom website design pays homage to their efforts as well as recruits new Tutors to the worthy cause at Project Literacy. While there are lots of nice design elements and page features incorporated into the custom website design the real beauty of the site is in the user experience and flow. It is so dialed in for each user that the design supports their specific needs beautifully. The results have been amazing with huge improvements on the length of time spent on the site, the conversions from the landing pages and the recognition of top sponsors. The professional and inviting design really showcases the quality service Project Literacy provides. We have also increased the amount donated directly online which is always nice. One of the most telling comments though is from Project Literacy’s Executive Director Diana Groffen. Who mentioned that you can just feel the positive energy of the Students and Volunteer at the organization, everyone wants to be there and their commitment, attitude and enthusiasm creates a real sense of accomplishment. We hope the new custom website design also reflects that energy and dynamic.